Yes, Stanley Tucci the actor, that Stanley Tucci. Actor or not, this man knows his Italian food. Nothing against actors, in fact, I got this as a birthday present a number of years ago precisely because I enjoy Tucci's acting so much, but I had no idea this book would be the treasure trove it is. Drawing on several generations of his family's most cherished recipes, this is a book is all about making Italian dishes the old-fashioned way: everything, everything homemade with lots of love and olive oil. Favorite Recipe: Drum of Ziti - It's pasta inside of pasta inside of pasta. Pasta-ception! This book also contains my go-to recipe for homemade pizza dough: only a few ingredients and just the right amount of rise. There is some truth to the old adage "Most of the world eats to live, but Italians live to eat." What is it about a good Italian supper that feels like home, no matter where you're from? Heaping plates of steaming pasta . . . crisp fresh vegetables . . . simple hearty soups . . . sumptuous stuffed meats . . . all punctuated with luscious, warm confections. 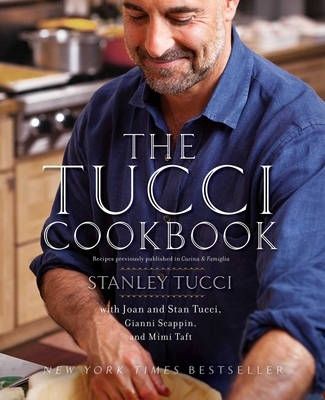 Featuring nearly 200 irresistible recipes, perfectly paired with delicious wines, The Tucci Cookbook is brimming with robust flavors, beloved Italian traditions, mouthwatering photographs, and engaging, previously untold stories from the family's kitchen.